Click HERE to find out more about Madame Fan at The NCO Club! Chef Mike Tan introduces Madame Fan’s Prosperity Yu Sheng which is a healthier version of what can be commonly-found outside - it incorporates ingredients like crispy rice noodles, purple cabbage, silver fish, pomelo, mandarin orange and green mango to create not only a visually-stunning dish but also one that you can enjoy without feeling an immense sense of guilt. Unfortunately this item is a dine-in only item which means you will not be able to take it home and pass it off as your own. For extra indulgence, opt of premium add-ons like live abalone from South Africa (S$68++ per 100g), Boston lobster (S$68++ per 100g), geoduck (S$68++ per 100g) or go all out with the Kaluga Caviar (S$170++ per 50g). 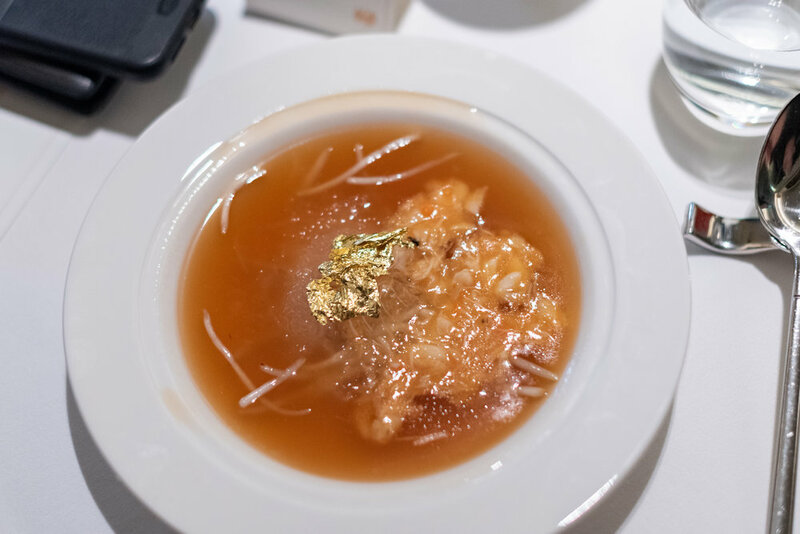 The second course that I sampled during this invitation was the Bird Nest, Crab Meat and Crab Roe with Supreme Stock. As if the ingredients in this dish were not lavish enough, Madame Fan actually serves this with a gold leaf for that glittery touch. If you do not like bean sprouts, make sure you let the restaurant staff know beforehand otherwise you might have to spend a decent amount of time picking them out. Braised tofu is a staple dish for me and Madame Fan offers a much more premium version (at least compared to what I usually have) with the South Africa Abalone and Tofu with Seasonal Vegetables. The braised sauce is delicious and I wish I actually had a bowl of white rice to eat it all up - the handmade tofu is also ridiculously soft (in a good way) and I really enjoyed this dish. Ordering a whole fish in a Cantonese restaurant is always a flashy move - it is the surest way (at least in a restaurant setting like this) to let your friends and family know that you have a fat wallet. The Steamed Red Spot Garoupa with Hong Kong Pat Chun Premium Soy, Ginger and Spring Onion is done perfectly and honestly if there was an occasion where you should order such an opulent dish, Chinese New Year will probably be your best bet. Now, I think it is safe to say that everyone's favourite dish that evening is the Charcoal Grilled Wagyu with Foie Gras and while I know that the year has only just started, this is definitely one of the best things that I have eaten thus far. That fatty Wagyu beef melts like butter when it enters your mouth and eating it together with foie gras just made so much sense. As far as I know, this dish is not on the permanent menu but I really do hope that they put this on the dinner menu at least because I definitely want to relive this experience (you can also get up to 20% off when you have elite status in Marriott Bonvoy). Most set menus end with a carbohydrate (which is also why you should always leave enough room for them) and the Braised King Prawn, Ginger and Spring Onion with Ee Fu Noodles here at Madame Fan has once again raised this commonly-known dish to a higher level on the scale of lavishness. Finally for dessert, the Chocolate Crémeux with Mandarin Orange is as good as it looks. There are six private dining rooms here at Madame Fan and there is even a VIP dining room that can accommodate up to 14 guests. On Chinese New Year Eve, there will be two seatings available (it is best to contact the restaurant for reservations ASAP if you wish to book them) at 6:00PM to 8:00PM and at 8:30PM to 10:30PM. Madame Fan Bar is also now on American Express' Chillax Program where you can get a complimentary welcome crafted cocktail with any eligible order from the bar.